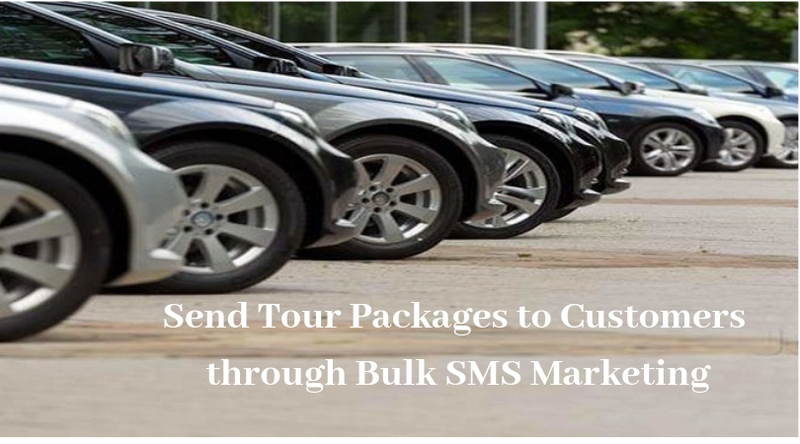 You can send tour packages to customers through Bulk SMS Marketing. Bulk SMS services can help customers to manage their customer needs. Tour and tourism are playing an important role in the economy of any country. Visitors from all around the world are fascinated by the charm and beauty of Indian locations, monuments, hill stations, and other historical places. The main aim of the tour and travel industry is to take the customers to their destination safely and comfortably on time. Bulk SMS plays an important role in the tour and travel industry. Tour and travel industry make use of bulk SMS service to reach the existing as well as the prospecting client. Tour and travel companies are using bulk SMS service to keep their customer informed about the latest services and offers. Like any other industry maintaining a good relationship with the customers is essential. With the help of bulk SMS services, companies can stay connected with their prospecting customers. Let us discuss how tour and travel package companies are making use of bulk SMS services. After customers confirm the booking, they want some proof that the booking they made was successful or not. Travel companies can send SMS to customers after the booking is complete. The customer is satisfied after receiving the SMS. And customer satisfaction is necessary to build a strong relationship with the client. Tour and travel companies can send discounts and offer to the customers. This will encourage the customers to take action a book for the travel package. Travel agencies can take advantage of the bulk SMS service to inform the customer about the discounts. Travel companies can also send personalized messages to the loyal customers offering them higher discounts. There may be some changes in the schedule during or before the tour. These changes may be due to weather conditions, flight delays or any other conditions that are not in the direct control of travel companies. But you need to inform the customer about the changes in schedules, flight delays or any other emergency. This makes the customers aware of the fact that why there is delay or changes in the schedule. Sending bulk SMS is an effective way to inform the travel group and keep them updated on the go. SMS marketing is an effective way to improve the sales of the travel business. SMS marketing is an effective way of building a business and attracting new customers. Travel businesses introduce new offers and discounts every now and then. But how to make customer information about the latest offers and discounts. Sending bulk SMS is a great way to inform the potential customer about the latest deals, offers, and discounts. SMS marketing is a great way to send tailor-made offers to the appropriate group of audience. For example, sending a teenage party notification to all the customers would not be an intelligent idea. SMS services help you to send the messages to only a particular age group in this case. So, SMS marketing helps in reducing costs and improving sales. Bulk SMS is an effective way to build a strong customer relationship. Travel companies can send happy and safe journey to their customer before the tour. They can also send information about the precautions they have to take and necessary items they have to carry during the journey. After they return from the journey, companies can ask them how their experience was and what can be improved. Travel companies can also wish the customers on their birthdays, anniversaries, festivals and other occasions to build a healthy relationship with the clients. Tour companies can guide customers about the location they are visiting. They can send customers information about most exotic places to visit in that location. Travel companies can entice customers by sending breathtaking images of locations they are going to visit. They can also be informed of the location updates, weather forecasts, and travel tips. This helps in making the trip more comfortable and engaging. Tour and travel companies can send information about the new locations which are prime HubSpot for the wanderlust. Travel companies can send images, articles and other information to tell the clients that how wonderful these places are and why you should go and visit those places. This will allure the customers to go on a trip. You can also offer discounts on these trips which will increase the chances of buying the travel package. Tour and travel companies can boost their sales by sending messages to all the prospecting clients in one go. Promotional messages can be sent to the customers so that they take action and contact the tour and travel company. Tour companies can also send their company website link where customers can get detailed information. Like any other sector, bulk SMS services can be used to leverage the sales and customer relations. Bulk SMS marketing has fetched results for tour and travel companies by promoting through bulk SMS. SMSLAB is offering cost-effective and efficient solutions that can help companies to increase their sales.